Hello, my sweeties! How have you been? After a long weekend, I'm back to my usual schedule of a busy bee life. Did you know that I just recently got featured on the Forever21 Instagram page? It is always fun to see how far my blog has progressed! Who could know that I would be part of the fashion industry? This week started out a bit complicated, because of the hot weather, my sick husband, and feeling low on inspiration. It happens sometimes to me, but after 2-3 days, I get my power back and new ideas flow into my head. In any event, I decided to wear something more casual, so that anyone can pull it together. I'm wearing F21 long shirt that I bought a couple months ago. Sadly, it is sold out now, but you should check Cotton-Blench one (click here). As for the bottom, I chose to wear 2020ave skinny jeans and added my new Public Desire heels. Public Desire was nice to give me their shoes to try. Every time I wear them, I always get compliments! A great price, unique style and fast shipping - it is everything that every girl needs! To complete my casual wear, I accessorized with a Poupee de Papier tote bag. Stylish everyday wear ! Love the outfit and your hair colour ! 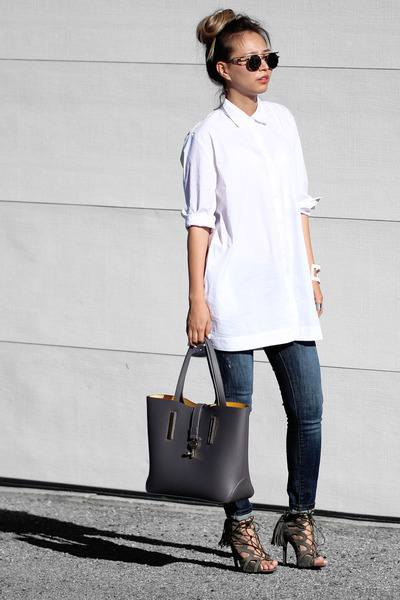 Casual and polished, love it!